Have a safe week, and be sure to enjoy every bit of it – especially when it comes to my favorites: pie and egg nog! What are your favorite holiday treats? Let us know in the comments. We are undergoing some scheduled site maintenance this weekend, and as a result, many of our sites will not be functioning between Friday 5/31 5pm Pacific time and Saturday 6/1 10pm Pacific time. All sites should be functioning again on Saturday 6/1 at 10pm Pacific time. Spring Training offer – 30% off courseware! Spring Training isn’t just for athletes – it can be for training your brain, too! 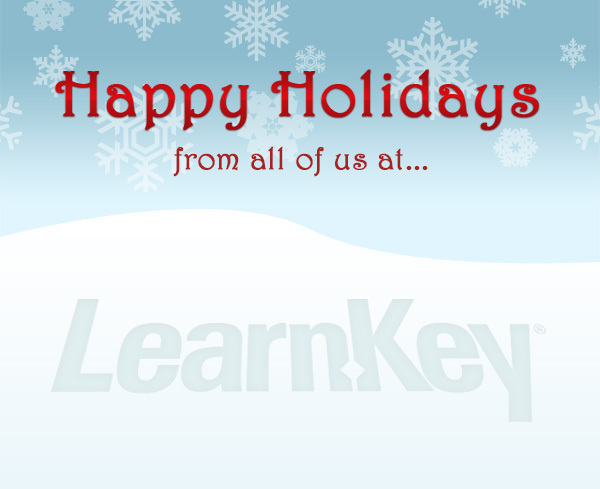 From now until the end of April, visit LearnKey.com, select from our many certification and personal development courses, and use coupon code SPRING2013 in the shopping cart to receive 30% off your purchase! Offer expires 4/30/2013. Applies to single-user courseware only, excludes MasterExams and books. We recently released a free tool for job seekers: elearningplanner.com – a leadership trait and career pathway assessment that identifies your specific leadership talents and recommends career paths based on your answers to a short (about 2 minutes) survey. We couldn’t just leave it at that though – we LearnKeyed it up a notch by matching eLearning bundles with your selected career paths, and to top it all off, every user receives a free Career Readiness 101 course at the end! So not only do you have a prescribed eLearning plan to become career-ready for your chosen path, but we give you some free Microsoft Office basics to get you started! To give you an idea of what kind of results you can get from the assessment, I decided to be the test subject and go through it myself and post my results. With the leading talent as patience, you will naturally be a dependable, persistent leader. You will be most efficient in leadership when you can manage to a process or system. You value making a difference for others and therefore naturally earn respect and create harmony in a group or team. Naturally, you will like support and serve your team, allowing them to have the praise and recognition for their accomplishments. You will do well when you have clearly defined deadlines for meeting team goals and objectives. Now for accuracy: notice how “Graphic Design Professional” is on my list of recommended career paths? While I manage LearnKey’s online marketing and social media, my strengths lean toward graphic design and layout. As for my leadership style – a structured, clearly defined environment has always been where I thrive the most. Scheduling projects all willy-nilly throws off my workflow and I’m nowhere near as productive as I could be. My results show exactly that! If you’re interested in finding out what your ideal career paths and leadership talents are, be sure to visit elearningplanner.com and take the survey for yourself. Be sure to sign up for the free Career Readiness 101 course at the end! The first of our Adobe CS6 courses has been released – Photoshop CS6 for Mac. In this course, LearnKey expert and Adobe Certified instructor Chad Chelius walks you through the features and tools of Photoshop CS6, while also covering the topics required for the ACA Visual Communication using Adobe® Photoshop® certification exam. This version of the course was shot using Adobe Photoshop CS6 for Mac OS X. Don’t worry, Windows users – your version is coming up soon! Visit the product page for more information about the course, including a full course outline and purchasing information. Good news, everyone! We recently released the latest version of our Network+ certification courseware – Network+ 2012 Certification. Just like our A+ Certification 2012 course, it features course author Tom Carpenter covering CompTIA’s certification objectives, this time taking students beyond tech essentials and guiding them through the world of Networking. This course covers the current CompTIA Network+ N10-005 exam. It includes 5 sessions and roughly 14 hours of training, tests, interactive labs, and projects. If you want to see more, check out the promo at the beginning of the post, and after visit the product page for more info on the course including a full course outline and purchasing info. We recently put together a new bundle which is perfect for high school students or people just starting out in the job market – the Career Readiness Bundle. This collection of courses teaches life and career skills important to succeeding in the business world. 12 new courses produced in partnership with Human Relations Media were released to be included in this bundle, and we added our previously released Know Your Talents™ course to the mix as well. Visit learnkey.com/careerreadiness for more information about the bundle and the courses included. As always, if you’re a current LearnKey customer, just give your favorite sales or customer service rep a call and they’ll make sure to get it added to your library! When it comes to using LearnKey courseware, most of our offerings have been student-focused, with tools for teachers typically being on the delivery side built into the LMS. In our goal to make our courseware easier to implement in the classroom, LearnKey has been working with our sister company LearnCast to provide more tools for teachers, and recently launched Mobile Mentoring – a tool that utilizes online and mobile technology to help facilitate learning.